2,000 light years away, in the Orion constellation, lurks an eerie looking creature, made of glowing gas lit up by young stars: the Cosmic Bat. Its real name is NGC 1788. It’s a reflection nebula, meaning the light of nearby stars is strong enough to light it up, but not strong enough to ionize the gas, like in an emission nebula. Even though the stars are young and bright, the Cosmic Bat is still hidden. It took the powerful Very Large Telescope (VLT) to capture this image. Our universe is capable of some truly frightening scenarios, and in this case we have an apparent tragedy: two stars, lifelong companions, decide to move away from the Milky Way galaxy together. But after millions of years of adventure into intergalactic space, one star murders and consumes the other. It now continues its journey through the universe alone, much brighter than before, surrounded by a shell of leftover remnants. At least, we think. All we have to go on right now is a crime scene. The Milky Way is an extremely big place. Measured from end to end, our galaxy in an estimated 100,000 to 180,000 light years (31,000 – 55,000 parsecs) in diameter. And it is extremely well-populated, with an estimated 100 to 400 million stars contained within. And according to recent estimates, it is believed that there are as many as 100 billion planets in the Milky Way. And our galaxy is merely one of trillions within the Universe. So if we were to break it down, just how much matter would we find out there? Estimating how much there is overall would involve some serious math and incredible figures. But what about a single light year? As the most commonly-used unit for measuring the distances between stars and galaxies, determining how much stuff can be found within a single light year (on average) is a good way to get an idea of how stuff is out there. Even though the name is a little confusing, you probably already know that a light year is the distance that light travels in the space of a year. Given that the speed of light has been measured to 299,792, 458 m/s (1080 million km/h; 671 million mph), the distance light travels in a single year is quite immense. All told, a single light year works out to 9,460,730,472,580.8 kilometers (5,878,625,373,183.6 mi). So to determine how much stuff is in a light year, we need to take that distance and turn it into a cube, with each side measuring one light year in length. Imagine that giant volume of space (a little challenging for some of us to get our heads around) and imagine just how much “stuff” would be in there. And not just “stuff”, in the sense of dust, gas, stars or planets, either. How much nothing is in there, as in, the empty vacuum of space? There is an answer, but it all depends on where you put your giant cube. Measure it at the core of the galaxy, and there are stars buzzing around all over the place. Perhaps in the heart of a globular cluster? In a star forming nebula? Or maybe out in the suburbs of the Milky Way? There’s also great voids that exist between galaxies, where there’s almost nothing. There’s no getting around the math in this one. First, let’s figure out an average density for the Milky Way and then go from there. Its about 100,000 to 180,000 light-years across and 1000 light-years thick. According to my buddy and famed astronomer Phil Plait (of Bad Astronomy), the total volume of the Milky Way is about 8 trillion cubic light-years. And the total mass of the Milky Way is 6 x 1042 kilograms (that’s 6,000 trillion trillion trillion metric tons or 6,610 trillion trillion trillion US tons). Divide those together and you get 8 x 1029 kilograms (800 trillion trillion metric tons or 881.85 trillion trillion US tons) per light year. That’s an 8 followed by 29 zeros. This sounds like a lot, but its actually the equivalent of 0.4 Solar Masses – 40% of the mass of our Sun. In other words, on average, across the Milky Way, there’s about 40% the mass of the Sun in every cubic light year. But in an average cubic meter, there’s only about 950 attograms, which is almost one femtogram (a quadrillionth of a gram of matter), which is pretty close to nothing. Compare this to air, which has more than a kilogram of mass per cubic meter. To be fair, in the densest regions of the Milky Way – like inside globular clusters – you can get densities of stars with 100, or even 1000 times greater than our region of the galaxy. Stars can get as close together as the radius of the Solar System. But out in the vast interstellar gulfs between stars, the density drops significantly. There are only a few hundred individual atoms per cubic meter in interstellar space. And in the intergalactic voids; the gulfs between galaxies, there are just a handful of atoms per meter. Like it or not, much of the Universe is pretty close to being empty space, with just trace amounts of dust or gas particles to be found between all the stars, galaxies, clusters and super clusters. So how much stuff is there in a light year? It all depends on where you look, but if you spread all the matter around by shaking the Universe up like a snow globe, the answer is very close to nothing. We have written many interesting articles about the Milky Way Galaxy here at Universe Today. Here’s 10 Interesting Facts About the Milky Way, How Big is the Milky Way?, How Many Stars are There in the Milky Way?, Where is the Earth Located in the Milky Way?, How Far is a Light Year?, and How Far Does Light Travel in a Year? The Hubble Space Telescope has revealed some amazing things over the past few decades. Over the course of its many missions, this orbiting observatory has spotted things ranging from distant stars and galaxies to an expanding Universe. And today, twenty-six years later, it is still providing us with rare glimpses of the cosmos. For example, just in time for the holidays, Hubble has released images of two rosy, glowing nebulas in the Small Magellanic Cloud (SMC). These glowing clouds of gas and dust were spotted as part of a study known as the Small Magellanic Cloud Investigation of Dust and Gas Evolution (SMIDGE), an effort to study this neighboring galaxy in an attempt to better understand our own. The images were taken by Hubble’s Advanced Camera for Surveys (ACS) in September 2015 and feature NGC 248 – two gaseous nebulas that were first observed by astronomer Sir John Herschel in 1834 and are situated in such a way as to appear as one. Measuring about 60 light years in length and 20 light-years in width, these nebulas are among a series of emission nebulas located in the neighboring dwarf satellite galaxy. Emission nebulas are essentially large clouds of ionized gases that emit light of various colors – in this case, bright red. The color and luminosity of NGC 248 is due to the nebulas heavy hydrogen content, and the fact that they have young, brilliant stars at the center of them. These stars emit intense radiation that heats up the hydrogen gas, causing it to emit bright red light. As noted, the images were taken as part of the SMIDGE study, an effort on behalf of astronomers to probe the Milky Way satellite – which is located approximately 200,000 light-years away in the southern constellation Tucana – using the Hubble Space Telescope. The ultimate goal of this study is to understand how dust is different in galaxies that have a far lower supply of the heavy elements needed to create it. In the case of the SMC, it has between one-fifth and one-tenth the amount of heavy metals as the Milky Way. In addition, its proximity to the Milky Way makes it a convenient target for astronomers who are looking to better understand the history of the earlier Universe. Essentially, most star formation in the Milky Way happened at a time when the amount of heavy elements was much lower than it is now. In addition to the stunning images, the SMIDGE team and the Space Telescope Science Institute have also produced a video that shows the location of NGC 248 in the southern sky. As you can see, the video begins with a ground-based view of the night sky (from the southern hemisphere) and then zooms in on the Small Magellanic Cloud, emphasizing the field where NGC 249 appears. Check out the video below, and have yourselves a Merry Christmas and some Happy Holidays! Welcome back to Messier Monday! In our ongoing tribute to the great Tammy Plotner, we take a look at the Messier 16 open star cluster – aka. The Eagle Nebula (and a slew of other names). Enjoy! One of these objects it he Eagle Nebula (aka. NGC 661. The Star Queen Nebula and The Spire), a young open cluster of stars located in the Serpens constellation. 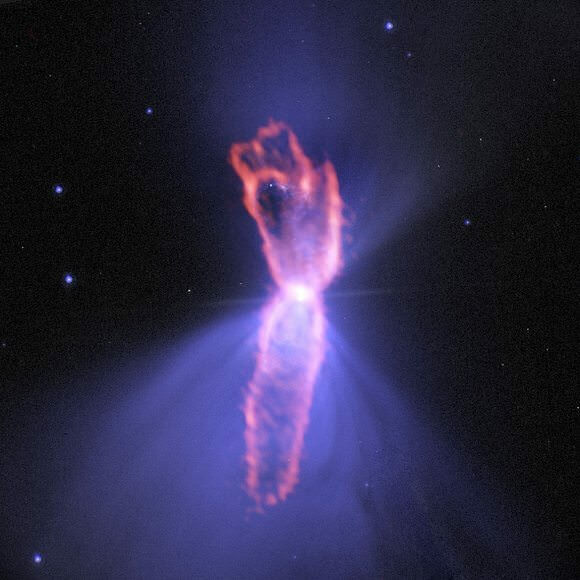 The names “Eagle” and “Star Queen” refer to visual impressions of the dark silhouette near the center of the nebula. The nebula contains several active star-forming gas and dust regions, which includes the now-famous “Pillars of Creation“. Located some 7,000 light years away in the next inner spiral arm of the Milky Way galaxy, the Eagle Nebula spans some 70 by 50 light years across. Born around 5.5 million years ago, this glittering swarm marks an area about 15 light years wide, and within the heart of this nebula is a cluster of stars and a region that has captured our imaginations like nothing else – the “Pillars of Creation”. Here, star formation is going on. 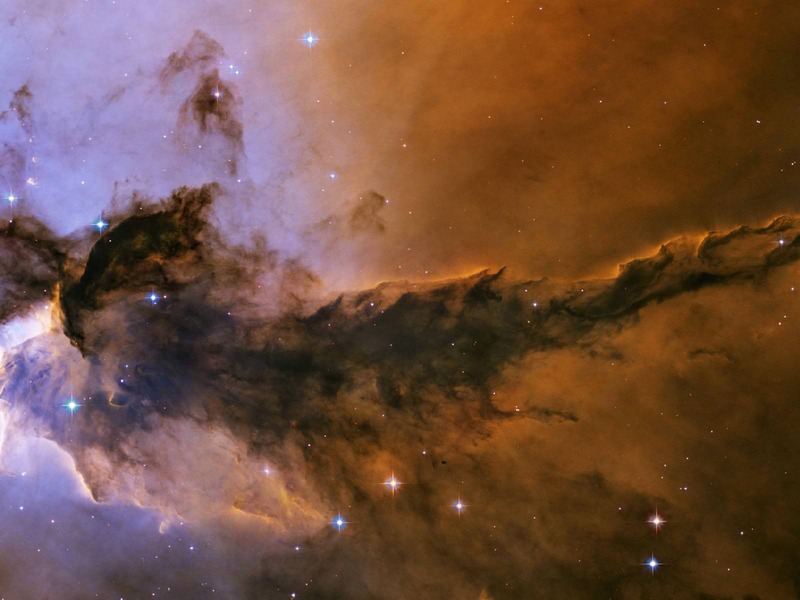 The dust clouds are illuminated by emission light, where high-energy radiation from its massive and hot young stars excited the particles of gas and makes them glow. Inside the pillars are Evaporating Gaseous Globules (EGGs), concentrations of gas that are emerging from the “womb” that about to become stars. These pockets of interstellar gas are dense enough to collapse under their own weight, forming young stars that continue to grow as they accumulate more and more mass from their surroundings. As their place of birth contracts gravitationally, the interior gas reaches its end and the intense radiation of bright young stars causes low density material to boil away. The Eagle Nebula’s pillars of creation taken in 1995 (right) and 2015. The new image was obtained with the Wide Field Camera 3, installed by astronauts in 2009. Credit: Left: NASA, ESA/HST/Hubble Heritage Team/STScI, J. Hester and P. Scowen (Arizona State University). But of course, the nebula isn’t an easy object to spot and its visibility on any given night depends greatly on sky conditions. As historical evidence suggest, only one of the two masters (Messier) caught it. So take a lesson from history and return to the sky many times. One day you’ll be rewarded! One of the easiest ways to find M16 is to identify the constellation of Aquila and begin tracing the stars down the eagle’s back to Lambda. When you reach that point, continue to extend the line through to Alpha Scuti, then southwards towards Gamma Scuti. Aim your binoculars or image correct finderscope at Gamma and put it in the 7:00 position. For those using a finderscope, M16 will easily show up as a faint haze. Even those using binoculars won’t miss it. If Gamma is in the lower left hand corner of your vision – then M16 is in the upper right hand. For all optics, you won’t be able to miss the open star cluster and the faint nebulosity of IC 4703 can be seen from dark sky locations. Another way to find M16 is by first locating the “Teapot” asterism in Sagittarius constellation (see above), and then by following the line from the star Kaus Australis (Epsilon Sagittarii) – the brightest star in Sagittarius – to just east of Kaus Media (Delta Sagittarii). Another way to find the nebula is by extending a line from Lambda Scuti in Scutum constellation to Alpha Scuti, and then to the south to Gamma Scuti. Those using large aperture telescopes will be able to see the nebula well, but sky conditions are everything when it comes to this one. The star cluster which is truly M16 will always be easy, but the nebula is a challenge. Nebulae: What Are They And Where Do They Come From? A nebula is a truly wondrous thing to behold. Named after the Latin word for “cloud”, nebulae are not only massive clouds of dust, hydrogen and helium gas, and plasma; they are also often “stellar nurseries” – i.e. the place where stars are born. And for centuries, distant galaxies were often mistaken for these massive clouds. Alas, such descriptions barely scratch the surface of what nebulae are and what there significance is. Between their formation process, their role in stellar and planetary formation, and their diversity, nebulae have provided humanity with endless intrigue and discovery. For millennia, human beings have stared up at the night sky and stood in awe of the Milky Way. Today, stargazers and amateur astronomers continue in this tradition, knowing that what they are witnessing is in fact a collection of hundreds of millions of stars and dust clouds, not to mention billions of other worlds. But one has to wonder, if we can see the glowing band of the Milky Way, why can’t we see what lies towards the center of our galaxy? Assuming we are looking in the right direction, shouldn’t we able to see that big, bright bulge of stars with the naked eye? You know the one I mean, it’s in all the pictures! Unfortunately, in answering this question, a number of reality checks have to be made. When it is dark enough, and conditions are clear, the dusty ring of the Milky Way can certainly be discerned in the night sky. However, we can still only see about 6,000 light years into the disk with the naked eye, and relying on the visible spectrum. Here’s a rundown on why that is. First of all, the sheer size of our galaxy is enough to boggle the mind. NASA estimates that the Milky Way is between 100,000 – 120,000 light-years in diameter – though some information suggests it may be as much as 150,000 – 180,000 light-years across. Since one light year is about 9.5 x 1012km, this makes the diameter of the Milky Way galaxy approximately 9.5 x 1017 – 1.14 x 1018 km in diameter. To put that in layman’s terms, that 950 quadrillion (590 quadrillion miles) to 1.14 quintillion km (7oo septendecillion miles). The Milky Way is also estimated to contain 100–400 billion stars, (although that could be as high as one trillion), and may have as many as 100 billion planets. At the center, measuring approx. 10,000 light-years in diameter, is the tightly-packed group of stars known as the “bulge”. At the very center of this bulge is an intense radio source, named Sagittarius A*, which is likely to be a supermassive black hole that contains 4.1 million times the mass of our Sun. Radio image of the night sky. Credit: Max Planck Institute for Radio Astronomy, generated by Glyn Haslam. In addition to being a spiral barred galaxy, the Milky Way is what is known as a Low Surface Brightness (LSB) galaxy – a classification that refers to galaxies where their surface brightness is, when viewed from Earth, at least one magnitude lower than the ambient night sky. Essentially, this means that the sky needs to be darker than about 20.2 magnitude per square arcsecond in order for the Milky Way to be seen. This makes the Milky Way difficult to see from any location on Earth where light pollution is common – such as urban or suburban locations – or when stray light from the Moon is a factor. But even when conditions are optimal, there still only so much we can see with the naked eye, for reasons that have much to do with everything that lies between us and the galactic core. Though it may not look like it to the casual observer, the Milky Way is full of dust and gas. This matter is known as as the interstellar medium, a disc that makes up a whopping 10-15% of the luminous/visible matter in our galaxy and fills the long spaces in between the stars. The thickness of the dust deflects visible light (as is explained here), leaving only infrared light to pass through the dust. This makes infrared telescopes like the Spitzer Space Telescope extremely valuable tools in mapping and studying the galaxy, since it can peer through the dust and haze to give us extraordinarily clear views of what is going on at the heart of the galaxy and in star-forming regions. However, when looking in the visual spectrum, light from Earth, and the interference effect of dust and gas limit how far we can see. Astronomers have been staring up at the stars for thousands of years. However, it was only in comparatively recent times that they even knew what they were looking at. For instance, in his book Meteorologica, Aristotle (384–322 BC) wrote that the Greek philosophers Anaxagoras (ca. 500–428 BCE) and Democritus (460–370 BCE) had proposed that the Milky Way might consist of distant stars. However, Aristotle himself believed the Milky Way was be caused by “the ignition of the fiery exhalation of some stars which were large, numerous and close together” and that these ignitions takes place in the upper part of the atmosphere. Like many of Aristotle’s theories, this would remain canon for western scholars until the 16th and 17th centuries, at which time, modern astronomy would begin to take root. Meanwhile, in the Islamic world, many medieval scholars took a different view. For example, Persian astronomer Abu Rayhan al-Biruni (973–1048) proposed that the Milky Way is “a collection of countless fragments of the nature of nebulous stars”. Ibn Qayyim Al-Jawziyya (1292–1350) of Damascus similarly proposed that the Milky Way is “a myriad of tiny stars packed together in the sphere of the fixed stars” and that these stars are larger than planets. Despite these theoretical breakthroughs, it was not until 1610, when Galileo Galilei turned his telescope towards the heavens, that proof existed to back up these claims. With the help of telescopes, astronomers realized for the first time that there were many, many more stars in the sky than the ones we can see, and that all of the ones that we can see are a part of the Milky Way. Over a century later, William Herschel created the first theoretical diagram of what the Milky Way (1785) looked like. In it, he described the shape of the Milky Way as a large, cloud-like collection of stars, and claimed the Solar System was close to the center. Though erroneous, this was the first attempt at hypothesizing what our cosmic backyard looked like. It was not until the 20th century that astronomers were able to get an accurate picture of what our Galaxy actually looks like. This began with astronomer Harlow Shapely measuring the distributions and locations of globular star clusters. From this, he determined that the center of the Milky Way was 28,000 light years from Earth, and that the center was a bulge, rather than a flat area. In 1923, astronomer Edwin Hubble used the largest telescope of his day at the Mt. Wilson Observatory near Pasadena, Calif., to observe galaxies beyond our own. By observing what spiral galaxies look like throughout the universe, astronomers and scientists were able to get an idea of what our own looks like. Since that time, the ability to observe our galaxy through multiple wavelengths (i.e. radio waves, infrared, x-rays, gamma-rays) and not just the visible spectrum has helped us to get an even better picture. In addition, the development of space telescopes – such as Hubble, Spitzer, WISE, and Kepler – have been instrumental in allowing us to make observations that are not subject to interference from our atmosphere or meteorological conditions. But despite our best efforts, we are still limited by a combination of perspective, size, and visibility barriers. So far, all pictures that depict our galaxy are either artist’s renditions or pictures of other spiral galaxies. Until quite recently in our history, it was very difficult for scientists to gauge what the Milky Way looks like, mainly because we’re embedded inside it. To get an actual view of the Milky Way Galaxy, several things would need to happen. First, we would need a camera that worked in space that had a wide field of view (aka. Hubble, Spitzer, etc). Then we’d need to fly that camera to a spot that’s roughly 100,000 light years above the Milky Way and point it back at Earth. With our current propulsion technology, that would take 2.2 billion years to accomplish. Fortunately, as noted already, astronomers have a few additional wavelengths they can use to see into the galaxy, and these are making much more of the galaxy visible. In addition to seeing more stars and more star clusters, we’re able to see more of the center of our Galaxy as well, which includes the supermassive black hole that has been theorized as existing there. For some time, astronomers have had name for the region of sky that is obscured by the Milky Way – the “Zone of Avoidance“. Back in the days when astronomers could only make visual observations, the Zone of Avoidance took up about 20% of the night sky. But by observing in other wavelengths, like infrared, x-ray, gamma rays, and especially radio waves, astronomers can see all but about 10% of the sky. What’s on the other side of that 10% is mostly a mystery. In short, progress is being made. But until such time that we can send a ship beyond our Galaxy that can take snapshots and beam them back to us, all within the space of our own lifetimes, we’ll be dependent on what we can observe from the inside. We have many interesting articles on the Milky Way here at Universe Today. For example, here’s What is the Milky Way? And here’s an article on why it’s called The Milky Way, how big it is, why it rotates, and what the closest galaxy is to it. And here are 10 Facts About the Milky Way. And be sure to check out our Guide to Space section on the Milky Way. And be to sure to check out Universe Today’s interview with Dr. Andrea Ghez, Professor of Astronomy at UCLA, talking about what is at the center of our Galaxy.